I’m considering renaming Bohemian to “Mr. Feisty Pants” since he’s been feeling his oats so much lately. On Tuesday he got turned out and longed before I showed up, so I decided to just hop on him instead of longe him again (I mean, really, what horse needs to get out 4 times in one day?). Well I won’t say I regretted the decision, but next time I’ll strongly consider the extra longe! He was as feisty as summer salsa, but we got plenty of work done and had fun. Lots of cantering. And the forward kind, not the up-and-down kind. So, it’s been almost a month since I’ve had Hemie, and we are making strides in his physique. Picture taken after Tuesday’s ride. 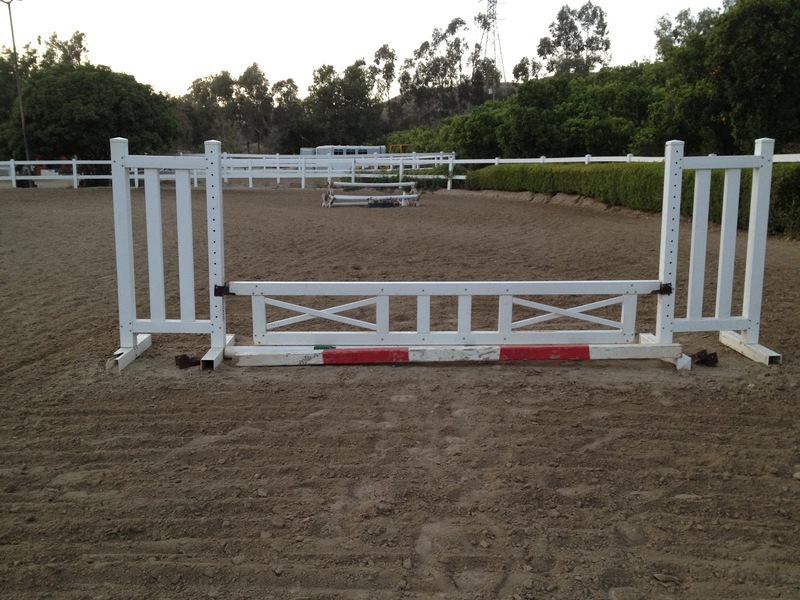 Last night’s lesson was jump-tastic. Hemie was hot (again! sheesh!) but very willing to get down to business. We are now trotting into the arena to prevent stuck-ness at the gate (apparently common with racehorses), and he’s respectful of it. First we did a circle with poles at the quadrants. We went over them or around them, changing it up so he had to pay attention. Worked on that tough right bend, and on moving forward to avoid getting stuck. All went very well. 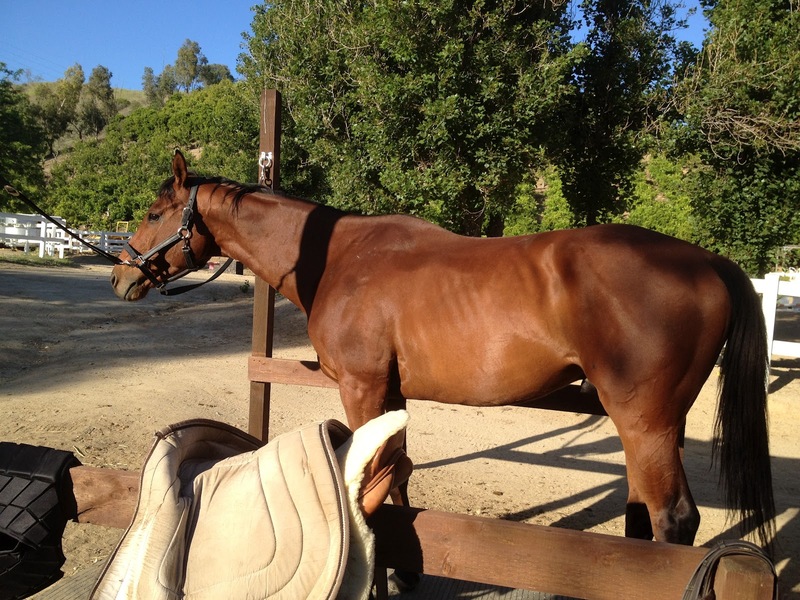 He already knows how to change leads, and is very flippant about his lead in the hind legs. In the canter if I ask for bend, or do a half-halt, or shift my weight, he switches leads. Very responsive. A little *too* responsive, but that will get figured out in time. Small crossrail up to ground pole – working on straightness after jumping. We had a mini-run-out at this crossrail – he was eyeing the placing pole *after* the jump (first time we introduced that – not in picutre). I corrected by halting him immediately and turning him towards the jump. 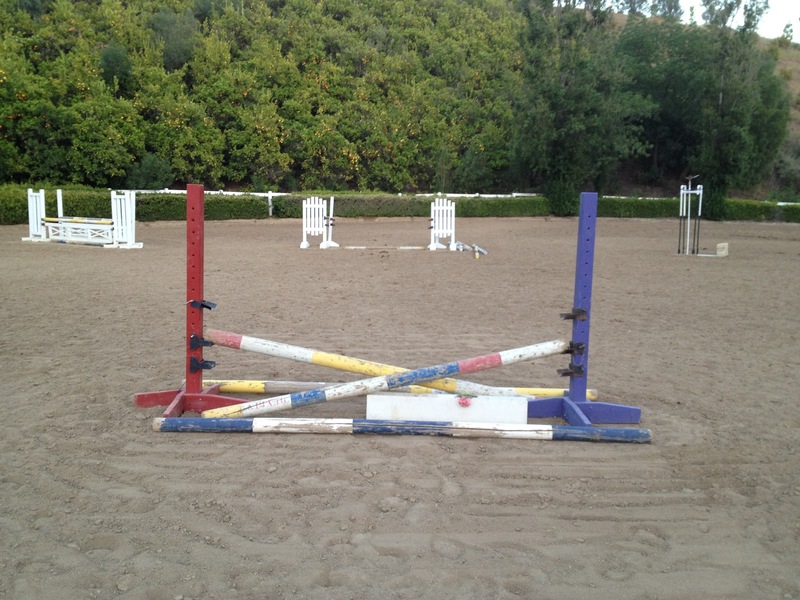 We walked over the jump and over the placing pole, so he could get a good look. 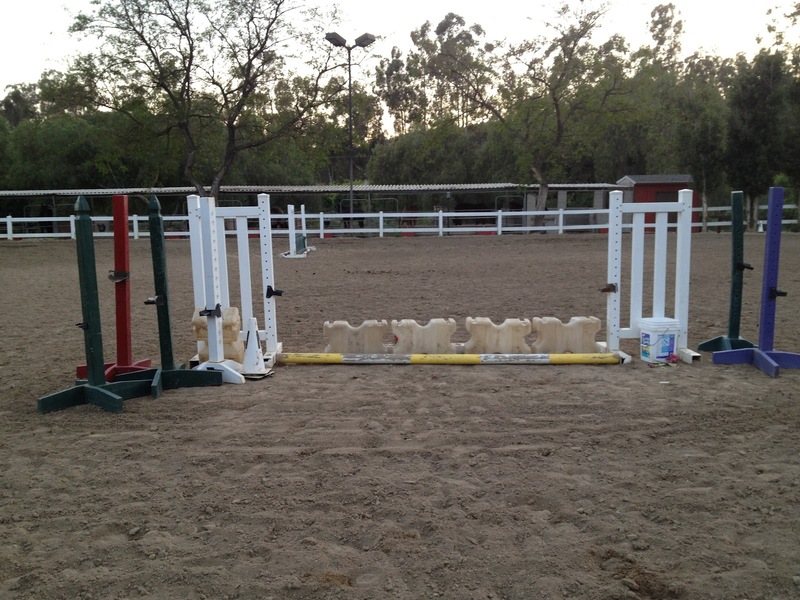 Then we jumped it fine several times. White gate, this time one notch higher than the last time we did it. He was nervous over these plastic thingys, but a little grumbling got him over. Downhill too. I was nervous about the green gate – definately larger than anything we’d done, and more solid-looking. She had us circle it closely for him to get an eye-full, then she had us approach at the walk and turn left (before the jump), then approach at the walk and turn right. As we approached his ears perked up, he had ZERO wiggle in his body, and a little spring in his step. Laurie and I both giggled – he wanted to jump it from the walk! 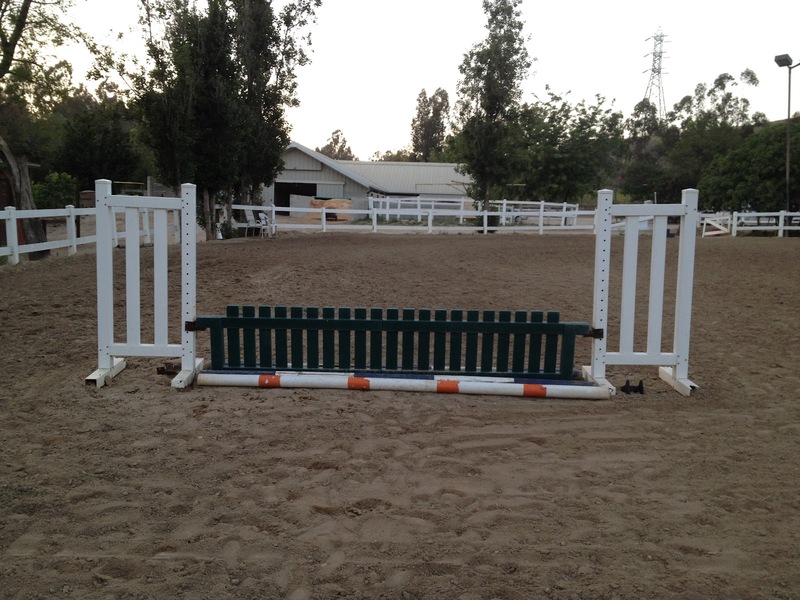 We trotted up to it and he flew over it like a pro. Well, he added like an extra 6″ for good measure, but he’ll soon learn where the jump is relative to his legs and feet. 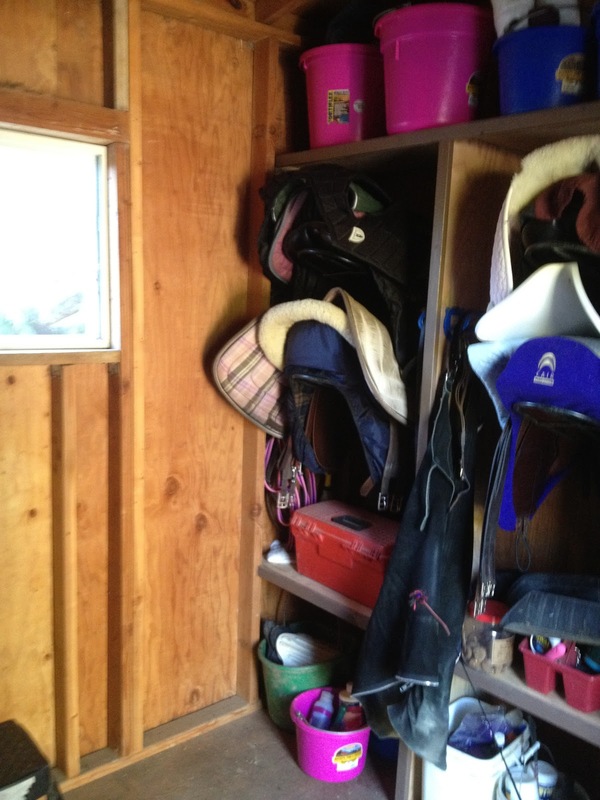 On a random tangent, here is a photo of my tack storage area at the barn. Everyone know’s its mine by the sheer number of pink buckets. Its a nifty little set-up, large enough to hold my stuff but small enough to encourage being organized. Excellent stuff! 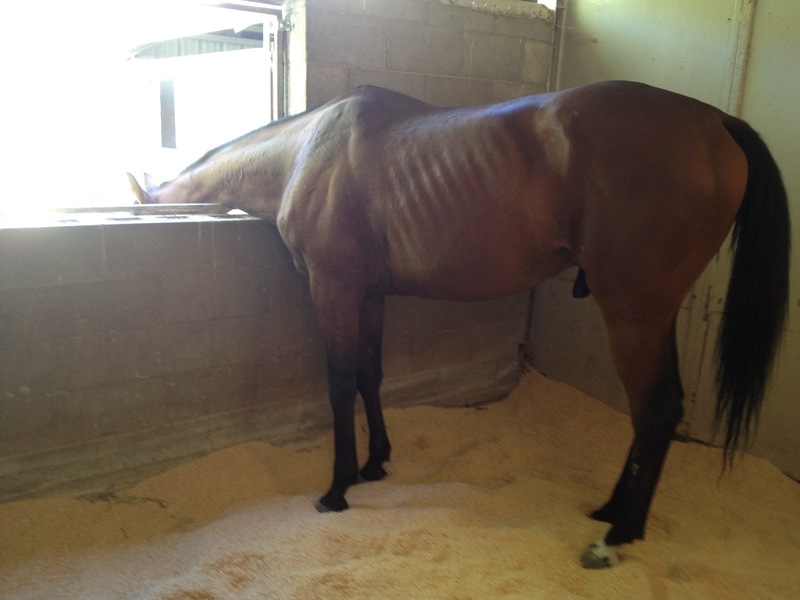 I am so happy that Hemie is working out so well!